Produced, shot, and directed by Communication Leadership student Amber Cortes, “Luchadora” shares the story of Avispa – a college student by day and a professional Lucha Libre wrestler by night. Lucha Libre is Mexico’s version of wrestling and its second-most popular sport, with a small following in the United States. It is recognizable by the acrobatic and theatric features, mysterious masks, and the opportunity to become your very own superhero (or villain) in the ring. Cortes made the short film in Comm Lead’s graduate-level multimedia production class taught by Sarah Stuteville and Alex Stonehill (seasoned documentary filmmakers who had their own feature-length film Barzan in the Seattle International Film Festival (SIFF) two years ago). “My first real film was challenging and Alex and Sarah were there to guide students every step of the way, both in terms of complicated technical stuff and getting to the heart of the narrative and making it shine,” Cortes said. 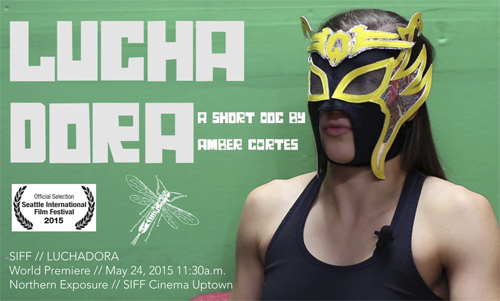 “Luchadora” will premiere at SIFF and will screen with other local shorts during the ‘Northern Exposure’ block on Sunday, May 24, 2015 at 11:30 a.m.